Eco Boy 3 – Added recording and coloring features. These apps use some/all of CoreData, MapKit, StoreKit, CoreLocation, online communication to Ruby-On-Rails/MySQL and other frameworks for email, address book access, audio recording/playback, iPod access, SMS functionality and more. In most cases, we also did the server side development (Linux based Ruby-On-Rails/MySQL). Vibracer: Fire and Ice – Unity3d based single-touch game to oscillate the character and avoid the ice for as long as you can. Charms Music – Student login, download accompaniment audio, record user and merge for upload. Pray4Today – Prayer log/journal including searching, tags, daily prayers and online backup. Fit4Today – Workout app based on the deck-of-cards workout with timer. Men’s Fraternity – iPhone/iPad In-App Purchase and download video/audio/workbook app allowing notes, highlight, drawing, etc. Pray4Missions – prayer calendar for missionaries, downloads from server to display date-based items. North Village Church – System for listing people to pray for, server and speak to. microRemote (not released yet) – Redrock – external accessory interaction with camera focus, range, depth of field, etc. PocketFuelCal – Professional drive utility to calculate surcharges based on fuel and operating costs. ProjectSamson – Fitness routine creation/sharing and execution including logs and InApp purchase features. Yakety Warp – Entertaining voice recording and manipulation. RoadLoans.com Loan Calc – Car loan calculator using principle, interest, time. iRate Beer/Lite – Personal (and shared) beer ratings, notes, etc. with online database. Beer Me/Lite – Pub/Bar/Tavern locator using current location, city/state/zip. Booples Soundboard – Interactive soundboard for children. Booples Songs/Videos – Includes all songs, videos available for In-App Purchase and download to view. PrayItForward – Anonymous prayer requests and praying for others. Tap Delay & Tempo Calc – Utility for recording engineers to determine necessary delays. TipJar App – Tip and location recording with charting and exporting reports. Several more apps that are under NDA, no longer available or currently being developed. 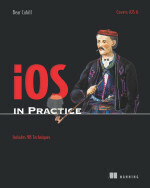 Plus, several apps for “iOS in Practice” (below). RockPaperScissors – GameCenter including leaderboards, communication and network play. MusicSearch – Search for music using the iTunes API and parsing the JSON results for displaying details, images and iPad version. Also includes iAds.